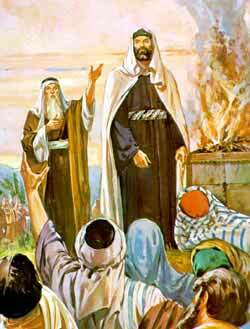 Samuel presents Saul to the people, as their king. AUL WAS THE son of Kish. He was tall and handsome and well-built, and from his shoulders upward, he was bigger than any of his people. One day the asses of Kish strayed away and were lost; and Kish said to his son, "Take one of the servants with you and arise, go seek the asses." They searched through Mount Ephraim, and through the land of Shalisha, but they did not find them. They passed through the land of Shalim, and through the land of the Benjamites, but still they could not find the asses. Then Saul began to think of returning home, for they had been away for a long time, and he feared that his father would be anxious for their safety. The servant suggested that they go to see a wise man who lived in a city near by and who had foretold many things which had come to pass. Together they went to the city to see the seer, and they met some maidens who told them that a sacrifice was being made that day and that the seer, whose name was Samuel, would be there to bless it; so they would be sure to find him. Now, the Lord had told Samuel that he would send him a man from the land of Benjamin to be the captain and king of all the people of Israel. So when Saul appeared, Samuel pointed him out and said to the assembled people, "There is the man." And to Samuel he said, "Come up with me to the high place. You shall eat with me today, and tomorrow I will let you go and you shall tell me everything that is in your heart. As for the asses, do not trouble about them, for they were found three days ago." Saul was puzzled, for he could not understand the honor that was being bestowed upon him, but Samuel gave him no chance to protest. He took Saul and his servant to the feast, and gave Saul the choicest portion to eat. The next morning Samuel anointed Saul, and led him before all the people and proclaimed him the new king. Saul tried to hide, but as he stood head and shoulders above all the other people, it was an easy matter to single him out. Amid the shouts and cheers of the people he was made King of Israel.